Garbage collection is becoming a serious problem. Code for Kanazawa is firstly focused on the correct way to dispose of garbage. 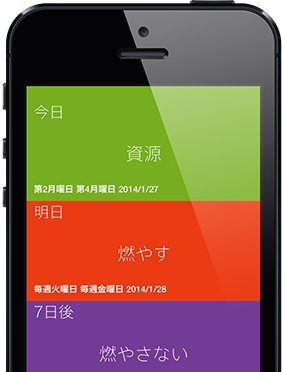 With this app, if you move to a new area of Kanazawa, you can find information about different trash disposal times for your neighborhood. Each type of trash is displayed in a different color. For trash that can be thrown away, tap the trash category to see the specific items that can be discarded. Set your location to automatically set your collection dates for each category of disposable trash. In the future, we are planning to use Smart Phone’s GPS to find your home’s position. 5374.jp was first started in Kanazawa by Code for Kanazawa in September 2013, and has since expanded into Ishikawa Prefecture (Nonoichi City) and is spreading to other places. Why not expand 5374 to your town? If a subdomain is required, let us know and we can set it up for you. Because 5374’s source code is open, it is possible to make this app usable for your town. Click here for more. With code, the world is happy. There are various challenges in each region, but also there are many communities (organizations) to solve these problems. Of those challenges, there are many that can be resolved with the power of design and IT, but not all community members have the skills for accessing these technological solutions. Code for Kanazawa will develop hardware and software to address the challenges of citizens, in order to organize and analyze the problem to that is can actually be solved by members of the community. Our mission is to help complete services that you would like to have designed, and to write software codes to solve your problem. We also have the power to continue to provide this service in the future. 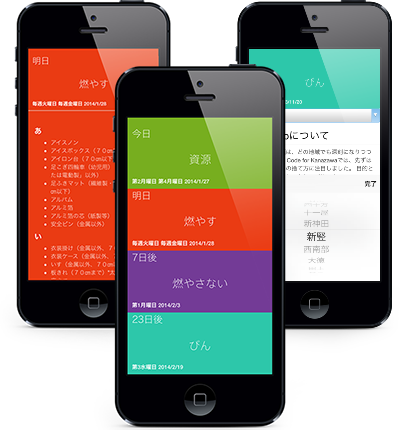 Code for Kanazawa is an organization made for citizens. We try to use the point of view of Kanazawa citizens, without the bias of the private sector and government organizations.